The house is furnished with antiques, and the bedrooms are spacious with comfortable beds. A sitting room is available to simply relax and read by the fire. A 15th century Coaching Inn called the Hutt, which was once owned by Lord Byrons family, is within walking distance and is open all day for meals; the Hutt retains a really cosy 'old world' charm. Sherwood Forest is minutes away and horse riding can be arranged with a reputable local stable; Llama trekking is also available. Other attractions within a short drive are, Southwell Minster, Thoresby Hall and Rufford Abbey; this part of the world is full of interesting small market towns and lovely rural drives. 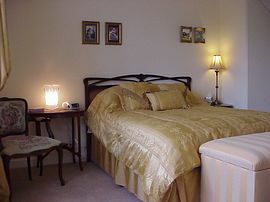 Double: £70.00 (single occupancy £65.00) including full breakfast. 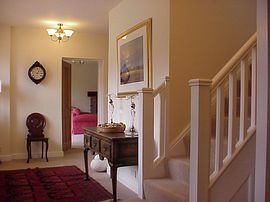 Twin: £60.00 (single occupancy £55.00) including full breakfast. Special Diets Provision: Special diets are catered for. Vegetarian breakfasts. "We did enjoy our weekend very much, and the trip around Newstead Abbey was fascinating. Thank you both for your kind hospitality and taking such good care of us - a truly lovely place to stay"
R & Y Wheatley, Suffolk. From A60 Nottingham direction turn right at the Hutt Inn into Longdale Lane; first left Vernon Ave; first left again Sheepwalk Lane. 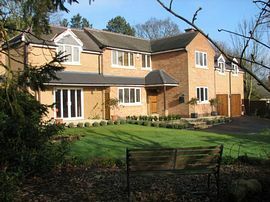 Church Drive is then second on the right, and Oak House is the second house on the left.